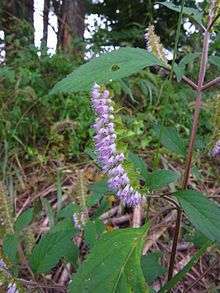 Elsholtzia is a plant genus in the Lamiaceae (mint family). It is widespread across much of temperate and tropical Asia from Siberia south to China, India, Indonesia, etc. The genus was named in honour of the Prussian naturalist Johann Sigismund Elsholtz. 1 2 3 "WCSP". World Checklist of Selected Plant Families. Retrieved 2012-09-22. ↑ Flora of China Vol. 17 Page 246 香薷属 xiang ru shu Elsholtzia Willdenow, Bot. Mag. (Romer & Usteri). 4(11): 3. 1790.